ELIMINase® eliminates RNase contamination-instantly and safely! Just squirt with ELIMINase® and it’s ready to use. 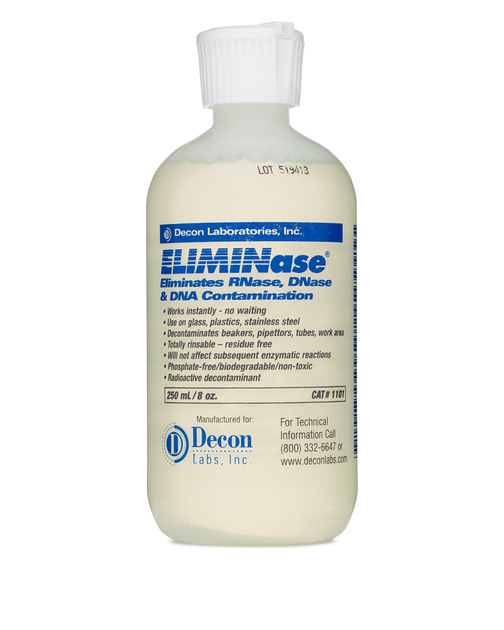 Safe on glass, plastics, stainless steel, pipettors, gel boxes, bench tops…ELIMINase® wipes out DNase and unwanted DNA, then rinses totally to leave no residue that could degrade RNA and DNA samples, or interfere with any subsequent enzymatic reaction. And ELIMINase® is a superb radioactive decontaminant! Works instantly – no waiting. Totally rinsable, residue-free, phosphate-free, non-toxic.